Memory errors might stop system operations, show error messages on the screen, or hang the system. 1. Boot from the diagnostics diskette and start the PQA program (please refer to System Diagnostic Diskette on page 39. 2. 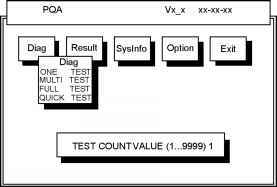 Go to the diagnostic memory in the test items. 4. Follow the instructions in the message window. NOTE Make sure that the DIMM is fully installed into the connector. A loose connection can cause an error. See Removing the Battery Pack on page 49 To remove the Extended memory from the machine, first remove the screw from the memory cover. 3. Push the memory cover leftward to lift the cover off, then remove the memory cover. 4. Push out the latches on both sides of the socket and pull the memory module out from the socket. 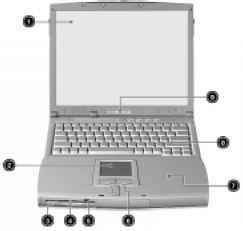 This utility diskette is for the TravelMate 220 260 series notebook machine. You can find the utility in Service CD kit. It provides the following functions To use this diskette, first boot from this diskette, then a Microsoft Windows ME Startup Menu prompt you to choose the testing item. Follow the instructions on screen to proceed. NOTE This program contains a readme.txt file. This readme.txt file will introduce each test utility and its functions. See Removing the Battery Pack on page 49 2. See Removing the Hinge Caps on page 56 3. See Removing the Middle Cover on page 56 4. Disconnect the launch board cable from the launch board. 5. Remove the two screws from the launch board then remove the launch board from the middle cover. Removing the Battery Pack on page 49 Removing the Hinge Caps on page 56 Removing the Middle Cover on page 56 Removing the Keyboard on page 57 Removing the Cable Cover on page 57 Removing the LCD Module on page 58 Removing the 14.1 TFT LCD Bezel on page 59 Removing the 13.3 TFT LCD Bezel on page 60 Removing the 14.1 TFT LCD on page 63 Removing the 13.3 TFT LCD on page 64 11. Remove the ESD tape and then the microphone cable from the LCD panel. Kensington-compatible key-based computer security lock. 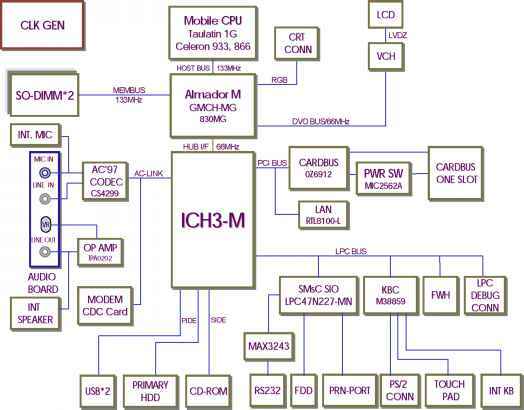 Connects to one Type II or one Type III 16-bit PC card or 32-bit CardBus PC Card. Connects to audio line-out devices (e.g., speakers, headphones) Accepts audio line-in devices (e.g., audio CD player, stereo walkman). Accepts a mono stereo condenser microphone. Controls the volume of the speakers. Accepts the video capture kit option on the left side of the computer. See Removing the Battery Pack on page 49 2. To remove the modem board, first remove the screw from the modem cover. 3. Remove the modem cover from the machine. 4. Remove two screws from the modem board as shown, then remove the modem board from the main unit carefully by using a plastic bladed screw driver. 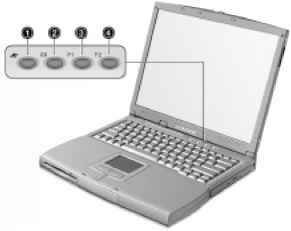 The computer has six easy-to-read status icons on the right of the display screen. The Power and Standby status icons are visible even when you close the display cover so you can see the status of the computer while the cover is closed. Lights when the computer enters Standby mode and blinks when it enters into or resumes from hibernation mode. 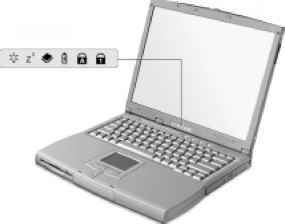 Lights when the floppy drive, hard disk or AcerMedia drive is active. Lights when the battery is being charged. Lights when Numeric Lock is activated. See Removing the Battery Pack on page 49 2. See Removing the Hinge Caps on page 56 3. See Removing the Middle Cover on page 56 4. See Removing the Keyboard on page 57 5. See Removing the Cable Cover on page 57 6. See Removing the LCD Module on page 58 7. See Removing the CPU Heat Sink Plate on page 67 8. See Removing the RTC Battery on page 67 9. See Removing the Upper Case on page 69 10. Remove the screw from the audio board and then detach the audio board. See Removing the Battery Pack on page 49 2. To disassemble the CD-ROM drive module, first remove four screws as shown. 3. Remove the CD-ROM drive module from the CD-ROM drive chassis. 4. Remove the two screws from the CD-ROM board then remove the CDROM board from the drive. See Removing the Battery Pack on page 49 2. See Removing the Hinge Caps on page 56 3. See Removing the Middle Cover on page 56 4. See Removing the Keyboard on page 57 5. See Removing the Cable Cover on page 57 6. See Removing the LCD Module on page 58 7. See Removing the 13.3 TFT LCD Bezel on page 60 8. Remove two screws on each side to remove the LCD brackets. See Removing the Battery Pack on page 49 2. See Removing the Hinge Caps on page 56 3. See Removing the Middle Cover on page 56 4. To remove the keyboard, first pull out and upward to expose the keyboard. 5. Disconnect the keyboard cable from the main board carefully, then remove the keyboard from the main board. See Removing the Battery Pack on page 49 2. See Removing the Hard Disk Drive Module on page 52 3. To disassemble the hard disk drive module, first remove the two screws from the hard disk drive bracket. 4. Remove the gasket from the hard disk drive module. 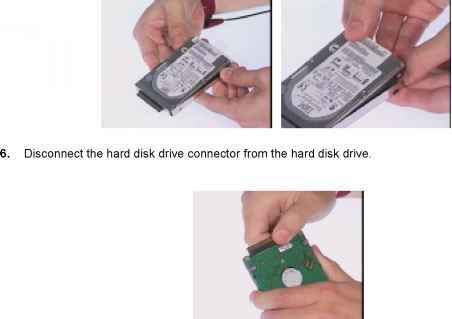 Bend both sides of the hard disk drive then remove the hard disk drive from the hard disk drive bracket. See Removing the Battery Pack on page 49 2. See Removing the Hinge Caps on page 56 3. See Removing the Middle Cover on page 56 4. See Removing the Keyboard on page 57 5. See Removing the Cable Cover on page 57 6. See Removing the LCD Module on page 58 7. See Removing the CPU Heat Sink Plate on page 67 8. See Removing the RTC Battery on page 67 9. See Removing the Upper Case on page 69 10. Remove the four screws to detach the CPU heatsink from the main board.